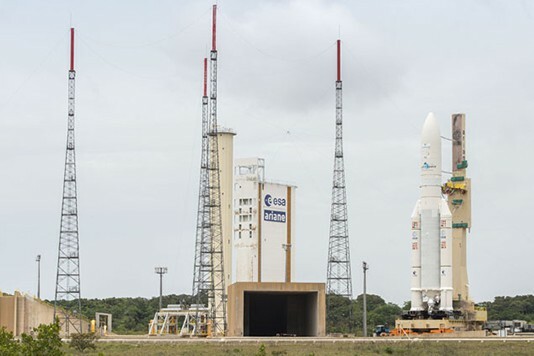 The final countdown is underway for Arianespace’s fourth Ariane 5 mission of 2015, which is scheduled for a 5:10 p.m. liftoff (local time) from the Spaceport in French Guiana with the EUTELSAT 8 West B and Intelsat 34 satellites. This latest dual-passenger flight for the heavy-lift Ariane 5 workhorse continues Arianespace’s sustained mission pace using its full launcher family – which also includes the medium-lift Soyuz and lightweight Vega. Today’s launch to geostationary transfer orbit, designated Flight VA225 in the company’s numbering system, will be the seventh mission conducted by Arianespace at French Guiana so far this year. Its payload performance is estimated at 9,922 kg. – including the two satellites’ liftoff mass, along with hardware for Ariane 5’s dual payload deployment system. 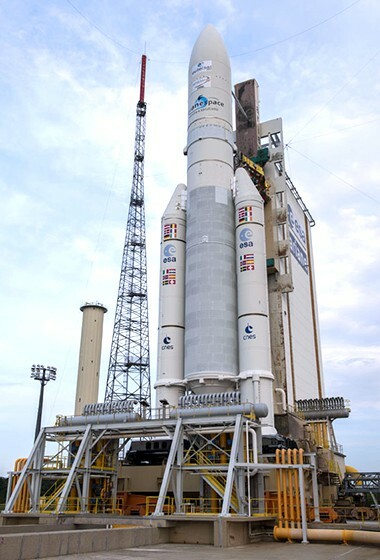 The 5,800 kg.-class EUTELSAT 8 West B is riding in Ariane 5’s upper position, to be deployed first during the flight. Europe’s Thales Alenia Space produced the relay platform, designed to bring powerful new satellite broadcasting resources to the Middle East and North Africa – primarily serving direct-to-home markets from an 8 deg. West orbital slot. It also introduces a C-band mission to this geostationary orbit position, covering the African continent and reaching to South America. Intelsat 34 is in the lower passenger position on Ariane 5. This 3,300-kg. satellite will operate from an orbital slot of 304.5 deg. East, utilized by Intelsat for the media distribution requirements of leading programmers for Latin America. The relay platform was produced by SSL (Space Systems Loral) of the U.S., and also is to support advanced broadband coverage for maritime and aeronautical providers serving the North Atlantic.